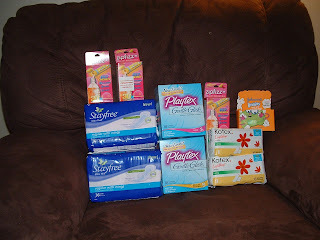 Gotta love feminine product sales! Total ECB back = 21.47 ! in responce to your comment you left on my blog about "feeling a stick in your stomach when you/other people pay full price for anything"
OHHHHH SO TRUE! lol! milk here is between $1.99-$2.50 a gallon on sale from week to week. Every once in awhile I have to pay $2.69-$2.99 if I'm in a hurry but recently my sister has been so busy that she always runs out of milk. So she leaves $5 on the kitchen table with a note for either one of her sons (16 & 10 yo) to go buy some milk. They have a 7-11 and 2 gas stations in walking distance so of course they are paying insane prices for milk. Each time they do this they grab the little half gallons and pay over $3!! insane! So a few weeks ago when WAGS had 2/$5 I was over there and grabbed the $5 and made them get 2 full gallons! lol! nice haul! i definitely need to go shop right now. You did pretty well! I'm loving couponing!